WP Staging Pro read that article. The tutorial below explains how to manually migrate your site by using WP Staging basic version. Read the instructions below very carefully and do not miss any step! Note: The video below shows WP Staging Pro pushes your staging site to the production website. The WP Staging free version, on the other hand, needs a few manual steps to do it. So let’s get started with using WP Staging free version to convert the staging site to the production one. Goal: After reading this tutorial you are able to convert your existing staging site to the live website. Limitations: Contrary to the use of WP Staging Pro the manual process makes your staging site unavailable and you need to create a new one after finishing the whole process. At first, backup the entire production and staging site. I recommend the BackWPup plugin which is a great and very reliable backup tool. Even the free version allows to backup files to FTP, Amazon S3 storage or to a folder on the server. I do not explain the use of BackWPup here but it is very self-explanatory. Use an FTP program like Filezilla and copy over the folders wp-content/uploads, wp-content/plugins and wp-content/themes from your staging site subfolder to the production site. Option 2 – Advanced: Use a separate DB migration plugin migration plugin. This is the easiest way and recommended if you do not care that the live site will use the staging site database tables after the conversion process. Note: After doing that your staging site will not be available any longer and you need to create a new one. 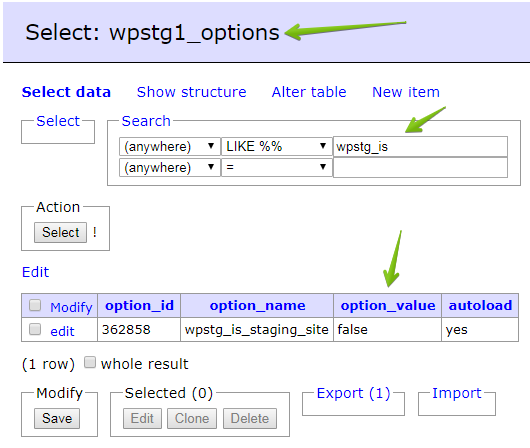 At first, you need to do a search and replace over the staging database tables. Find all strings containing the path to the staging site and replace them with strings leading to the live site. You can test this by opening the staging site and checking the complete URL in the browser window. Make sure to work accurately. Enter exact strings! – Do not enter any trailing slash after the URL! Any misspelling will lead to a broken staging or even live site. Do not select any other tables! All other tables belong to the live site or to other staging sites which must not be altered in any way! In the next step, you can select the dry-run option. This allows to run the search and replace process without changing any real data and is a good indicator if the provided settings are correct and if the search and replace plugin is working as expected. Click on the Run Search/Replace button. If the dry-run has been run successfully to the end, deselect the dry-run option and run the search and replace process again. The next step is to delete the value in the database which checks if a database table belongs to the staging site or to the live site. This is used by WP Staging to show the authentication screen. Delete this value or set it to false. The last step is to tell the WordPress live site to use the database tables of the staging site. For this, you need an FTP account to access your website and a FTP software. I recommend the use of filezilla. It’s entirely free and open source. 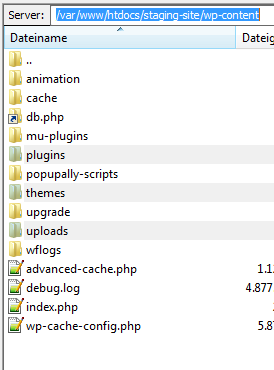 Use FTP again and open the config file wp-config.php of your live site. Change the value of $table_prefix to the same value that is used by the staging site, e.g. This makes sure that your live site is using all the database tables of the staging site. You are done. Just open the live site and you will see that it reflects all the data from the staging site. Now, the live site is using the staging site database and all the content from the staging site has been copied over to the live site. You are done. That’s it. Just a note: As the staging site database tables are used by the live site you need to create a new staging site from now on. The old staging site can not be used any longer.